During a recent church visitor assimilation webinar (available now for purchase), we discussed some excellent resources on the assimilation process. One participant recommended a short book on hospitality ministry that was helpful to them. 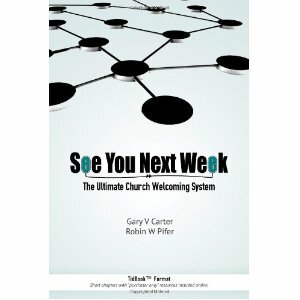 See You Next Week is a short text crammed full of ideas that could help your church get started in improving the welcome and integration process in your church. If you haven’t read any books on this topic, this book might fit what you are looking for. It can help your congregation develop it’s friendliness. I’ve read several books on church hospitality. I’ve written two myself. This particular book would be aimed at the church that doesn’t have an existing hospitality committee or advocate who wants to run the ministry and needs someone to start taking charge. See You Next Week would be a good primer and overview of the church welcome and hospitality process. If you have already read some of the related books in this field, you won’t learn anything new. However, See You Next Week would help you refresh your interest. The ending section on 11 principles for your volunteers would serve any ministry leader well as a resource for their volunteer training. In either case, you can find short and quick tips that you would need to polish your existing hospitality and welcome ministry, and quick reminders for your volunteers. The book is not about evangelism, or even how to share the gospel along the way. The authors know that is an important topic, but it is outside of the scope of their focus on creating a good welcome and developing your ministry of assimilation. See You Next Week is laid out as short two page chapters, followed by a QR code and weblink to more in depth information. The importance of being friendly. First Impressions: the importance of managing it. 11 resolutions for all hospitality volunteers. I presume the promised online resources are still in development. The preface promised additional resources via the links. I sampled a random few and didn’t find the additional resources hinted at in the preface. Mostly, I found a page that has the text of the chapter, the audio reading of the chapter, and occasionally resource paper or additional resources. Maybe more resources are coming as the product development continues. It is full of practical tips on conversational small talk, how to relate to new comers, and various principles that volunteers should keep in mind when serving on a church’s hospitality or greeter ministry. They look at attitude, some mechanics, and some organizational elements of welcome and hospitality. The value I found in See You Next Week was the 11 resolutions for hospitality volunteers. These are directed at the volunteers, and you as a ministry leader could use them in your volunteer training. Most of the books I’ve read in this field talk a lot about the mechanics of hospitality, but this set of 11 principles was written specifically for the volunteer. It gives you specific ways you can live out a warm welcome from the relational side. A welcoming church where people love to join isn’t built overnight. You won’t get a chance at a second impression if you don’t make a good first impression. Nobody wants to be around sour people. With the “See You Next Week!” system you don’t need 100% involvement. It is a good idea to ask for full participation but if you get 25% participation your church will explode with new energy. If you get 10% participation you will see a noticeable difference in the number of newcomers who decide to make your church their church home. If all you get is one key person to team up with you, you can have high impact. But virtually all church attenders who have been in for very long have forgotten the negative emotions they had in anticipation of their first church experience. It is the negative anticipations that keep many people away. Some take the risk to attend for the first time; they need to be pleasantly surprised. Unchurched people don’t go to church unless something or someone gets them there for the first time. Your program definitely counts for something. But not as much as it used to because newcomers behave differently today. They used to care more about your complete church life. Nowadays, from their perspective, the intended full integration of the typical newcomer into your church life, will be to show up a few Sundays a month or even a season in your main meeting. Meeting people who come from other lands or cultures is especially awkward for many greeters. They hardly know where to begin. And, of course, because there are literally thousands of possible variations it is impossible to cover everything. However, opportunities abound to minister to newcomers from all nations of the world. You get one chance to make a first time impression with first time guests. Your need is to know the process for taking people from a first time newcomer to a healthy, growing, serving member of the church. You should lay out these important stages or touch points along the way. If you can’t describe what you are doing as a process you probably don’t actually know what you are doing. When a church has a really good process of welcoming they can increase the ratio of new people they are keeping while recognizing they will never keep them all. If you want to add a copy to your library, order yours here. If you do, I’ll get a few nickels. Or check out my own ebook that is available to download here. A purchase of my ebook will also reward you with a free consulting conversation with me about your hospitality ministry, plus information on the best way to get visitor contact information.